Excellent whisky. Unlike any other single malt that is around. Underripe bananas, lychees, vanilla extract, mango ice cream. There's loads of fruit here, but that's to be expected with these Irish single malts. A hint of charcoal and fermented veggies too. Excellent. Subtle notes of menthol and cough syrup (which is usually something reserved for pure pot still). Quite herbacious too. Mango makes an encore, and there's papaya too, with loads of other tropical influences. Herbal and fruity. Medium in length. Love the nose. A bit in your face. Peach. Bananas. Mango. Vanilla. Raspberry jam. The tropicalness just continues. Has a bit jammy development as well. ‘Fass’ [in German] means cask. 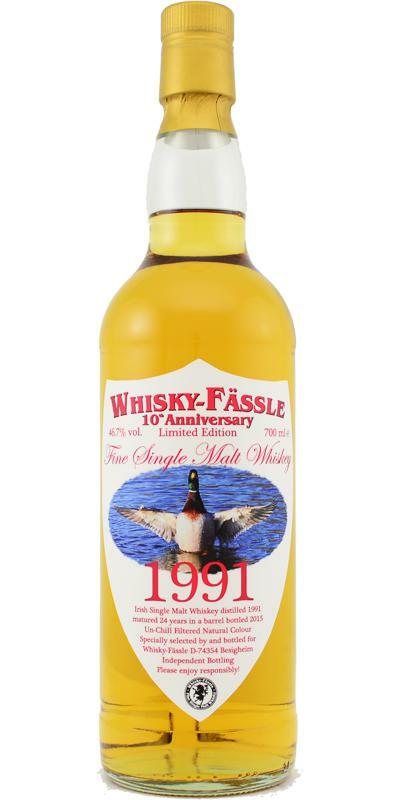 Fassle is the diminutive of fass, so it may translate from German to English as whisky ‘caskette’ for example. Thank you AS, i hope i understood that right. N: Buttery plimsoles, 1980's Puma bags [double handled, blue with a grey logo - remember the craze? ], smoked-charcoaled 'street-food' chestnuts, oily cereal fruits [soft green],.... already enough to marvel at but there's heaps here. Joyful. T: Complexities aside, this is instantly likeable & super-drinkable. I spent much time further marvelling at the puffy perfectly-sour barley spirit, aged without separate oak notes, i.e. cask integration. F: Whilst others focused on the fruits, my concentration was again on the moorish barley mash and the [bourbon] putty base. have written this before, it’s unbeatable (yet we’ll try…) SGP:651 - 89 points.